Definition at line 79 of file sha2_64.h. Definition at line 90 of file sha2_64.h. Definition at line 50 of file mdx_hash.cpp. Definition at line 241 of file sha2_64.cpp. Definition at line 84 of file sha2_64.h. Return a new hash object with the same state as *this. This allows computing the hash of several messages with a common prefix more efficiently than would otherwise be possible. This function should be called clone but that was already used for the case of returning an uninitialized object. Definition at line 40 of file sha2_64.cpp. const std::string & provider = ""
Create an instance based on a name, or return null if the algo/provider combination cannot be found. If provider is empty then best available is chosen. Definition at line 110 of file hash.cpp. References hash, Botan::make_bearssl_hash(), Botan::make_commoncrypto_hash(), and Botan::make_openssl_hash(). Referenced by botan_hash_init(), botan_pubkey_fingerprint(), Botan::MessageAuthenticationCode::create(), Botan::BlockCipher::create(), Botan::KDF::create(), Botan::PBKDF::create(), Botan::PasswordHashFamily::create(), Botan::HashFunction::create_or_throw(), Botan::Certificate_Store_In_Memory::find_cert_by_pubkey_sha1(), Botan::Certificate_Store_In_Memory::find_cert_by_raw_subject_dn_sha256(), Botan::get_eme(), Botan::get_emsa(), Botan::OCSP::CertID::is_id_for(), Botan::X942_PRF::kdf(), Botan::X509_Certificate::raw_subject_dn_sha256(), and Botan::X509_Certificate::X509_Certificate(). Create an instance based on a name If provider is empty then best available is chosen. provider provider implementation to use Throws Lookup_Error if not found. Definition at line 359 of file hash.cpp. Referenced by botan_pubkey_sm2_compute_za(), Botan::OCSP::CertID::CertID(), Botan::create_hex_fingerprint(), Botan::EMSA_PKCS1v15_Raw::EMSA_PKCS1v15_Raw(), Botan::TLS::Handshake_Hash::final(), Botan::generate_dsa_primes(), Botan::TLS::make_hello_random(), Botan::newhope_shareda(), Botan::newhope_sharedb(), Botan::X509_Certificate::raw_issuer_dn_sha256(), Botan::RTSS_Share::split(), and Botan::Cert_Extension::Subject_Key_ID::Subject_Key_ID(). Complete the computation and retrieve the final result. Definition at line 89 of file buf_comp.h. Referenced by botan_hash_final(), botan_mac_final(), Botan::ed25519_gen_keypair(), Botan::ed25519_sign(), Botan::ed25519_verify(), Botan::TLS::TLS_CBC_HMAC_AEAD_Encryption::finish(), Botan::TLS::TLS_CBC_HMAC_AEAD_Decryption::finish(), Botan::mgf1_mask(), Botan::pbkdf2(), Botan::RFC4880_decode_count(), Botan::sm2_compute_za(), and Botan::TLS_PRF::TLS_PRF(). Definition at line 96 of file buf_comp.h. Definition at line 111 of file buf_comp.h. Definition at line 85 of file mdx_hash.cpp. 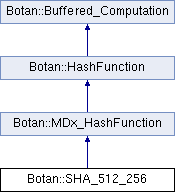 References Botan::MDx_HashFunction::clear(), Botan::clear_mem(), Botan::MDx_HashFunction::compress_n(), Botan::MDx_HashFunction::copy_out(), Botan::MDx_HashFunction::write_count(), and Botan::zeroise(). Definition at line 103 of file buf_comp.h. Definition at line 33 of file mdx_hash.h. Referenced by Botan::MD4::copy_state(), Botan::Whirlpool::copy_state(), Botan::RIPEMD_160::copy_state(), Botan::MD5::copy_state(), Botan::Tiger::copy_state(), and Botan::SM3::copy_state(). Definition at line 82 of file sha2_64.h. Definition at line 83 of file sha2_64.h. Update and finalize computation. Does the same as calling update() and final() consecutively. Definition at line 124 of file buf_comp.h. Definition at line 136 of file buf_comp.h. Definition at line 148 of file buf_comp.h. Definition at line 160 of file buf_comp.h. provider information about this implementation. Default is "base", might also return "sse2", "avx2", "openssl", or some other arbitrary string. Definition at line 196 of file sha2_64.cpp. Definition at line 369 of file hash.cpp. Add new input to process. Definition at line 34 of file buf_comp.h. Referenced by botan_hash_update(), botan_mac_update(), Botan::ed25519_gen_keypair(), Botan::ed25519_sign(), Botan::ed25519_verify(), Botan::TLS::TLS_CBC_HMAC_AEAD_Encryption::finish(), Botan::TLS::TLS_CBC_HMAC_AEAD_Decryption::finish(), Botan::mgf1_mask(), Botan::TLS::TLS_CBC_HMAC_AEAD_Decryption::output_length(), Botan::pbkdf2(), Botan::RFC4880_decode_count(), Botan::sm2_compute_za(), and Botan::TLS_PRF::TLS_PRF(). Definition at line 40 of file buf_comp.h. Definition at line 49 of file buf_comp.h. str the input to process as a std::string. Will be interpreted as a byte array based on the strings encoding. Definition at line 72 of file buf_comp.h. Definition at line 81 of file buf_comp.h. Definition at line 58 of file buf_comp.h. Referenced by Botan::mgf1_mask(), and Botan::pbkdf2(). Definition at line 108 of file mdx_hash.cpp. References BOTAN_ASSERT_NOMSG, Botan::Buffered_Computation::output_length(), Botan::store_be(), and Botan::store_le().